The Hawaii basketball team found a way in San Jose, and thus continued its winning ways. The Warriors won their fifth consecutive game, defeating San Jose State, 77-71, on Thursday night at The Event Center in San Jose, Calif.
Hawaii trailed by as many as 10 points in the first half, and was down 68-64 with less than four minutes remaining in the second half. But the Warriors closed the game with a 13-3 surge, including the go-ahead basket with 2:06 remaining by Bill Amis as the shot clock expired, and then a clutch 3-pointer by Zane Johnson to put it away with 40 seconds remaining. “Gosh, that was tons of fun,” Hawaii head coach Gib Arnold said. Hawaii, which has won nine of its last 11 games, improved to 18-10 overall and 8-7 in the Western Athletic Conference. With one regular-season game remaining, Hawaii is in a three-way tie for fourth place. The Warriors will play at Fresno State on Saturday. “It’s going to be a fun bus ride to Fresno, I can tell you that,” Arnold said. •	Johnson led the way with 26 points, including 6-of-10 shooting from 3-point range. His final 3-pointer of the game gave Hawaii a 74-69 lead with 40 seconds left. He was also primarily responsible for “limiting” San Jose State guard Adrian Oliver to 18 points on 4-of-15 shooting. Oliver entered the game ranked fourth in the country in scoring with 24.3 points per game. •	Amis had 19 points and grabbed a team-high nine rebounds. •	Vander Joaquim faced double-teams in the post throughout the game, but still had a solid all-around game with 12 points, seven rebounds, four blocked shots and four assists. •	Bo Barnes scored 12 points and grabbed four rebounds. •	Miah Ostrowski scored just two points, but had 10 assists with zero turnovers and was “big-time” at point guard, according to Arnold. •	Joston Thomas had six points and three rebounds in 19 valuable reserve minutes. •	Bobby Miles did not score, but had three assists and was part of a crucial play in the closing minutes. With Hawaii holding a 69-68 lead and less than two minutes remaining, San Jose State had possession of the ball. Oliver drove to the basket, but his elbow caught Miles in the head. After a lengthy review of the video, Oliver was called for an intentional foul. Barnes, who replaced Miles, drained both free throws to give Hawaii a 71-68 lead with 1:45 remaining. Hawaii played without two key players. Senior point guard Hiram Thomspon sat out his fourth consecutive game with an elbow injury; freshman forward Trevor Wiseman did not travel with team because he needed to attend his classes. He is expected to join the team at Fresno State. San Jose State had a four-game winning streak snapped, and dropped to 15-13 overall and 5-10 in the WAC. 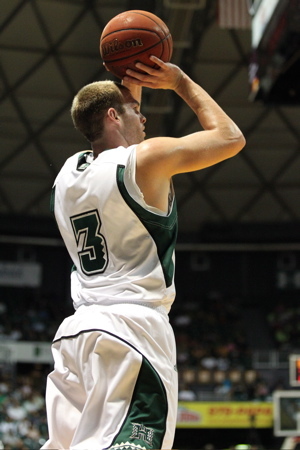 Hawaii shot 46.7 percent from the field, while limiting the Spartans to 37.3 percent. The Warriors passed for a season-high 21 assists, while committing just 12 turnovers. Hawaii, which was on a 15-game road losing streak earlier this season, has won four of its last five road games. And here is the latest edition of “Bill and Zane’s Excellent Adventure.” It features some video highlights from the team’s practice at Ohlone College on Wednesday night. Congrats team! Wish I could have watched the game online but I was in class. It made my night when I checked my phone for game updates and saw that they beat San Jose. Just beat Fresno on Saturday and we will be riding some major momentum into the WAC tourney. Which team looks the scariest going into the WAC tourney? Seriously; who would want to play us right now? Still gotta take care of business at Fresno State to keep momentum going. If so and Hawaii takes a six-game winning streak to Vegas … yes, very scary. Which leads to the always “what if” hindsight. What if Hawaii had won just one of the home games against Boise State, Idaho or Utah State? How scary would the Warriors be as a 2 seed? Scarier: What if Josten Thomas finally gets it? The WAC office just released scenarios for Saturday’s games, and Hawaii has no shot at getting the No. 4 seed for the WAC Tournament. The Warriors will be either the No. 5 or No. 6 seed, which means they will not get a first-round bye and will have to win four games in four days to win the WAC Tourney championship. Utah State and Boise State have clinched 1 and 2, so they will both be seeded into the semifinals. No. 3 will go to either Idaho or New Mexico State. No. 4 will go to either Nevada or Idaho. Why would Nevada get the 4 seed, wouldn’t there need to be a blind draw? Come on Warriors! Let’s keep the momentum going, man. Terrific win against a team that was hot. Too bad they’re not playing for a better tournament draw. There are five teams that could finish with 9-7 WAC records: Boise State, Hawaii, Idaho, Nevada and New Mexico State. Under the WAC’s tie-breaker system, Hawaii is behind all those other teams should they all finish 9-7. In the case of Nevada, a Nevada win over New Mexico State would be the clincher. That would give Nevada a sweep of NMSU, while Hawaii split with NMSU. Thanks for your insights. As much as I would like a bye, I think this team is starting to develop an attitude that they are going to win each time they step on the court and that all starts with Coach Arnold. How long has it been since we have had a team with a winning attitude like this. How many years have we heard how a team from Hawaii can’t win on the road, blah, blah, blah. The team looks really loose in those videos as well. I have been waiting a long time for UH basketball to not only embrace a winning attitude but a win anytime, anyplace attitude that has not existed in this program for many, many years. Go Warriors!